Based upon the novel by Charlotte Bronte. Helene Lecar, ed., Sidney Miller, art director. Jane Eyre. Classics Illustrated #39. Gilberton Company, Inc. 1974. Print. Character – While there was not the depth of development of character that can be found in the novel Jane Eyre, the editors did an admiral job of characterization within their limited means. The reader comes away with a basic understanding of the story behind the characters and their motivations. The illustrations definitely help distinguish between characters, i.e. it’s obvious which one is Mr. Rochester’s crazy wife due to her long, undone hair and disheveled appearance. Plot – The plot follows the original story without any major portions left out. 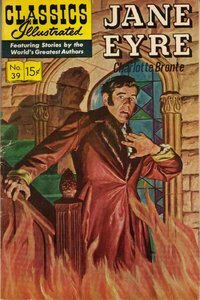 The editors made heavy use of plot explanation in this Classics Illustrated compared to others I’ve read, which were largely driven by dialogue. It works for this particular story to have the plot moved along in this fashion. Setting – There is obvious movement of place throughout the story as indicated by both plot cues and illustration. It is a bit difficult to distinguish when the story is occurring and would have been a nice insert at the beginning to at least give the time period to readers. The clothing worn by the characters in the book are not from the early 19th century, which is when the story takes place. This is, according to Donna Richardson’s American Heritage article, “Classics Illustrated,” a common problem among the series. Style – The art isn’t amazing, but it is good. The characters are easy to distinguish, even when following Jane from childhood to adulthood it is easy to tell which is her. As noted earlier, the artist made the personalities of the characters show in their depictions, such as Rochester’s wife looking crazy, Rochester himself looking rather stern and gentlemanly and Mrs. Reed looking rather grouchy and horrible. Theme – The main theme, Jane’s quest for family and a place which to belong, is conveyed rather nicely through the CI version, but I think it is a bit overshadowed by the drama created by the crazy wife in the attic and fire. The cover of the CI is of Rochester basically surrounded by flames. While this is very dramatic and interesting, it’s a bit misleading. Viewpoint – The CI is written in third person omniscient. It allows the reader to follow the story rather easily and is very accessible to young readers and those intimidated by the actual novel. It serves as a good introduction to it, cementing the major characters and plot in the reader’s mind before they embark upon the actual novel. This entry was posted in Book Reviews and tagged Bronte, Classics Illustrated Novels, graphic novels, Jane Eyre. Bookmark the permalink.